This book is a modern-day primer on the basic skills and techniques of fusing and is geared toward the absolute novice and assumes you know little or nothing about the craft. Filled with lots of step-by-step photos, useful tip sidebars, and complete project instructions. You will learn terminology used regularly in fusing, as well as all the basic skills that are the building blocks of the art. From tools and material descriptions to glass cutting and shaping, to more complicated procedures such as mold making and kiln operation, everything is covered. 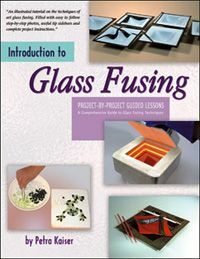 Chapters include topics such as: Warm Glass Processes and Temperatures, Glass Tools And Equipment, Kilns and Controllers, Basic Glass Cutting Techniques, and more. Each new technique is taught via the creation of an actual project, such as a Tangram Puzzle, a Window Ornament, a Night Light, a Set of Soup Bowls or Jewelry Pendants, thereby allowing you to learn a new skill and create an item to wear, display or use in your home.